Nose: Wood lacquer, chocolate, red wine, red liquorice, strawberry laces, sandalwood and cigar box. Palate: Muscavado, rich malt sugar, salty toffee, cola syrup, caramelised apple, dark cherry, dates, and cinnamon spice. Finish: Long and tingly with more cigar box. Interesting. In many ways, it has a lot in common with a well-aged dark rum with sugar, spice and wood dominating the palate. I think the PX finish definitely does the whisky a favour, because I get the impression this particular batch of spirit wasn’t cut particularly well. Even aged 21 it feels quite hot. Not unpleasantly so, but not as smooth and refined as I’d expect of a modern Bruichladdich that’d been in cask more than two decades. Distilled in the neglected days of Whyte and Mackay ownership, it’s a respectable recovery by Jim and the current Laddie team that still yields some great dusty wood and aromatic sherry fruit flavour. 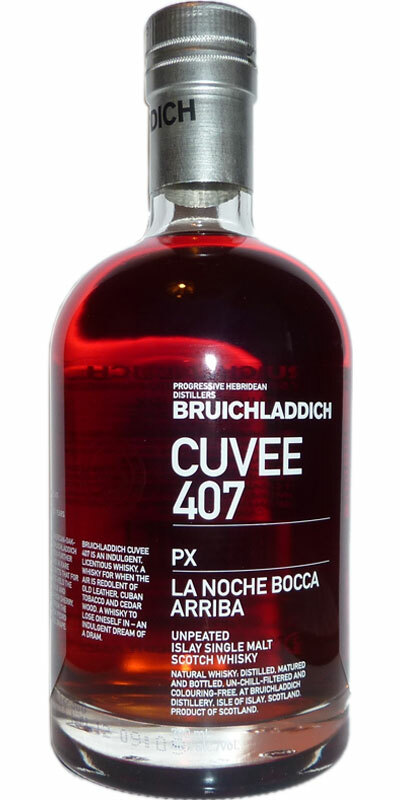 There are three Cuvée bottlings in this particular series: 640 Eroica (a brandy finish), 407 La Noche Bocca Arriba (PX), and 382 La Berenice (Sauternes/Barsac wine). All the same stock from American oak, and finished up to 21 years old. All are still available on the market (try Whisky Exchange) for around £90-£100.